"Picture this: You're at the supermarket trying to find the best deal on AAA batteries for your flashlight, so you check the price labels beneath each pack. Sounds pretty straightforward, right? But how can you tell which pack is cheaper when one is priced per battery and one is priced per 100?" The point, of course, is that CR must be seriously math-challenged if they don't know how to move a decimal point. I laughed at their example, and I thought maybe they just screwed up. But ... no, they also chose a silly example as their real-life evidence. In the article's photograph, they show two different salad-dressing labels, from the same supermarket. The problem: one is unit-priced per pint, but the other one is per quart. Comparing the two requires dividing or multiplying by two, which (IMO) isn't really that big a deal. But, sure, OK, it would be easier if you didn't have to do that. Except: the two bottles in CR's example are *the same size*. 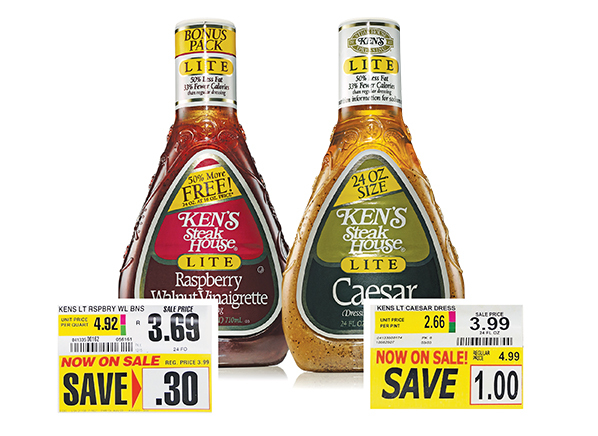 One 24-ounce bottle of salad dressing is priced at $3.69; the other 24-ounce bottle is priced at $3.99. And CR is complaining that consumers can't tell which is the better deal, because the breakdowns are in different units! That doesn't really affect their argument, but it does give the reader the idea that they don't really have a good grip on the problem. Which, I will argue, they don't. Their main point is valid -- that unit pricing is more valuable when the units are the same so it's easier to compare -- but you'd think if they had really thought the issue through, they'd have realized how ridiculous their examples are. The reason behind unit pricing, of course, is to allow shoppers compare the prices of different-sized packages -- to get an idea of which is more expensive per unit. That's most valuable when comparing different products. For the same product in different sizes, you can be pretty confident that the bigger packs are a better deal. It's hard to imagine a supermarket charging $3 for a single pack, but $7 for a double-size pack. That only happens when there's a mistake, or when the small pack goes on sale but the larger one doesn't. When it's different products, or different brands ... does unit pricing really mean a whole lot if you don't know how they vary in quality? "What if some batteries have different life expectancies?" There's an 18-pack of HappyPower AA batteries for $5.99, and a 13-pack of GleeCell for $4.77. Which is a better deal? I guess if the shelf label tells you that each HappyPower battery works out to 33 cents, but a GleeCell costs 37 cents, that helps you decide, a little bit. If you don't know which one is better, you might just shrug, go for the HappyPower, and save the four cents. If someone chose two random batteries, and random battery A cost 11 percent more in an 18-pack than random battery B in a 13-pack, which is likelier to be the better value? That's not just a battery question: it's a probability question. Actually, it's even more complicated than that. It's not enough to know whether you're getting more than 11 percent better value, because, to get that 11 percent, you have to buy a larger pack! Which you might not really want to do. Pack size matters. I think it's fair to say that, all things being equal, we almost always prefer a smaller pack to a larger pack. That must be true. If it weren't, smaller sizes would never sell, and everything would come in only one large size! To make a decision, we wind up doing a little intuitive balancing act involving at least three measures: the quality of the product, the unit price, and the size of the pack. The price is just one piece of the puzzle. In that light, I'm surprised that CR isn't calling for regulations to force supermarkets to post CR's ratings on the shelves. After all, you can always calculate unit price on the spot, with the calculator app on your phone. But not everyone has a data plan and a CR subscription. "[Among problems we found:] Toilet paper priced by '100 count,' though the 'count' (a euphemism for 'sheets') differed in size and number of plies depending on the brand." So, CR isn't just complaining that the labels use *inconsistent* units -- they're also complaining that they use the *wrong* units. So, what are the right units for toilet paper? Here in Canada, packages give you the total area, in square meters, which corrects for different sizes per sheet. But that won't satisfy CR, because that doesn't take "number of plies" into account. What will work, that you can compare a pack of three-ply smaller sheets with a pack of two-ply larger sheets? I guess they could do "price per square foot per ply." That might work if you're only comparing products, and don't need to get your head around what the numbers actually mean. They could also do "price per pound," on the theory that thicker, higher-quality paper is heavier than the thinner stuff. But that seems weird, that CR would want to tell consumers to comparison shop toilet paper by weight. In either case, you're trading ease of understanding what the product costs, in exchange for the ability to more easily compare two products. Where is the tradeoff? I don't think CR has thought about it. On the promo page for their article, they do an "apples and oranges" joke, showing apples priced at $1.66 per pound, while oranges are 75 cents each. Presumably, they should both be priced per pound. Now, I have no idea how much a navel orange weighs. If they were $1.79 a pound, and I wanted to buy one only if it were less than, say, $1, I'd have to take it over to a scale ... and then, I'd have to calculate the weight times $1.79. "To find the best value on the fruit below, you'd need a scale -- and a calculator." Well, isn't that less of a problem than needing a scale and calculator *to find out how much the damn orange actually costs*? I think CR hasn't really thought this through to figure out what it wants. But that doesn't stop it from demanding government action. One of the things they want to "correct" is a shelf label for a pack of cookies. The product description on the label says "6 count," meaning six cookies. The document demands that it be in grams. Which is ridiculous, in this case. When products come in small unit quantities, that's how consumers think of them. I buy Diet Mountain Dew in packs of twelve, not in agglomerations of 4.258 liters. It turns out that manufacturers generally figure out what consumers want on labels, even if CR is unable to. For instance: over the years, Procter and Gamble has made Liquid Tide more and more concentrated. You need less to do the same job. That means that the actual liquid volume of the detergent is completely meaningless. What matters is the amount of active ingredient -- in other words, how many loads of laundry the bottle can do. Which is why Tide provides this information, prominently, on the bottle. My bottle here says it does 32 loads. There are other sizes that do 26 loads, or 36, or 110, or ... whatever. "Unit prices must be based on legal measurement units such as those for declaring a packaged quantity or net content as found in the Fair Packaging and Labeling Act (FPLA). Use of unit pricing in terms of 'loads,' 'uses,' and 'servings' are prohibited." CR, and the DOC, believe that the best way for consumers to intelligently compare the price of a bottle of Tide to some off-brand detergent that's diluted to do one-quarter the loads ... *is by price per volume*. Not only do they think that's the right method ... they want to make any other alternative ILLEGAL. I have a suggestion to try to get CR to change its mind. A standard size of Tide detergent does 32 loads of laundry. The premium "Tide with Febreze" variation does only 26 loads. But the two bottles are almost exactly the same size. I'll send a letter. Hey, Consumer Reports! Procter and Gamble is trying to rip us off! The unit price per volume makes it look like the two detergents are the same price, but they're not! The other one is watered down! I bet next issue, there'll be an article demanding legislation to prohibit unit pricing by volume, so that manufacturers stop ripping us off. I'm mostly kidding, of course. For one thing, P&G isn't necessarily trying to rip us off. The Febreze in the expensive version is an additional active ingredient. (And a good one: it works great on my stinky ball hockey chest pad.) Which is "more product" -- 32 regular loads, or 26 enhanced loads? P&G thinks they're about the same, which is why they made the bottle the same size, to signal what it thinks the product is worth. Or, maybe they diluted both products similarly, and it just works out that the combined volume winds up similar. Either way, unit pricing by volume doesn't tell you much. Unless you want to think that, coincidentally, a load with Febreze is exactly 32/26 as valuable a "unit" as a load without. But then, what will you do when Tide changes the proportions? Anyway, I do agree with CR that it's better if similar products can be compared with the same unit. And, sometimes, that doesn't happen, and you get pints alongside quarts. But I disagree with CR that the occasional lapse constitutes a big problem. I disagree that supermarkets don't care what consumers want. I disagree that CR knows better than manufacturers and consumers. And I disagree that the government needs to regulate anything, including font sizes (which, yes, CR complains about too -- "as tiny as 0.22 inch, unreadable for impaired or aging eyes"). CR's goal, to improve things for comparison shoppers, is reasonable. I'm just frustrated that they came up with such bad examples and bad answers, and that they want to make it illegal to do it any way other than their silly wrong way. If their way is wrong, what way is right? Well, it's different for everyone. We're diverse, and we all have different needs. What should we do, for, say, Advil? Some people are always take a 200 mg dose, and will much prefer unit price per tablet. Me, I sometimes take 200 mg, and sometimes 400 mg. For me, "per tablet" isn't that valuable. I'd rather see pricing per unit of active ingredient. In addition, I'm willing to take two tablets for a higher dose, or half a tablet for a lower dose, whichever is cheaper. It's an empirical question. It depends on how many people prefer each option. Neither the government nor CR can know without actually going out and surveying. Having said all that ... let me explain what *I* would want to see in a unit price label, based on how I think when I shop. You probably think differently, and you may wind up thinking my suggestion is stupid. Which it very well might be. A small jar of Frank's Famous Apricot Jam costs 35 cents per ounce. A larger jar costs 25 cents per ounce. Which one do you buy? It depends on the sizes, right? If the big jar is ten times the size, you're less likely to buy it than if it's only twice the size. Also, it depends on how much you use. You don't want the big jar to go bad before you can finish it. On the other hand, if you use so much jam that the small jar will be gone in three days, you'd definitely buy the bigger one. But what if you've never tried that jam before? Frank's Famous Jam might be a mediocre product, like those Frank's Famous light bulbs you bought in 1985, so you might want to start with the small jar in case you hate it. You kind of mentally balance the difference in unit price among all those other things. Now, I'm going to argue: the unit price difference, "35 cents vs. 25 cents" is not the best way to look at it. I think the unit prices seriously underestimate the savings of buying the bigger jar. I think the issue that CR identified, the "sometimes it's hard to compare different units," is tiny compared to the issue that unit prices aren't that valuable in the first place. Why? Because, as economists are fond of saying, you have to think on the margin, not the average. You have to consider only the *additional* jam in the bigger jar. Suppose the small jar of jam is 12 ounces, and the large is 24 ounces (twice as big). So, the small jar costs $4.20, and the large costs $6.00. But consider just the margin, the *additional* jam. If you upgrade to the big jar, you're getting 12 additional ounces, for $1.80 additional cost. The upgrade costs you only 15 cents an ounce. That's 58 percent cheaper! If you buy the small jar instead of the big one, you're passing up the chance to get the equivalent of a second jar for less than half price. And that's something you don't necessarily see directly if you just look at the average unit price. I think that's a much more relevant comparison: 35 cents vs. 15 cents, rather than 35 cents vs. 25 cents. Don't believe me? I'll change the example. Now, the small jar is still 35 cents an ounce, but the large jar is 17.5 cents an ounce. Now, which do you buy? You always buy the large jar. It's the same price as the small jar! At those unit costs, both jars cost $4.20. That's obvious when you see that when you upgrade to the bigger jar, you're getting 12 ounces of marginal jam for $0.00 of marginal cost. It's not as obvious when you see your unit cost drop from 35 cents to 17.5 cents. "If you buy the next largest size of this same brand of Raisin Bran, you will get 40% more product for only 20% more price. Since 20/40 equals 0.5, it's like you're getting the additional product at 50 percent off." "Buy 20 oz. of Raisin Bran at regular price, get your next 8 oz. at 50% off." Unit price is a "rate" statistic. Sometimes, you'd rather have a bulk measure -- a total cost. If I want one orange, I might not care that they're $3 a pound -- I just want to know that particular single orange comes out to $1.06. In the case of the jam, I might think, well, sure, half price is a good deal, but I'm running out of space in the fridge, and I might get sick of apricot before I've finished it all. What does it cost to just say "screw it" and just go for the smaller one? In other words: how much more am I paying for the jam in the small jar, compared to what I'd pay if they gave it to me at the same unit price as the big jar? With the small jar, I'm paying 35 cents an ounce. With the big jar, I'd be paying 25 cents an ounce. So, I'm "wasting" ten cents an ounce by buying the smaller 12 ounce jar. That's a cost of $1.20 for the privilege of not having to upgrade to the bigger one. That flat cost is something that works for me, that I often calculate while shopping. I can easily decide if it's worth $1.20 to me to not have to take home twice as much jam. --This size costs $1.20 more than the equivalent quantity purchased in the next larger size. I'd love to see some supermarket try this before CR makes it illegal. Let's say a half-gallon (of milk, I don't buy bread in gallons) costs $2.00, and a whole gallon costs $3.25. Well, I'm not sure I can finish the gallon before it expires. But since the half-gallon sets the price at $1.00/quart, then in order for the whole gallon to be a better deal I just have to drink 3.25 quarts before it expires. To generalize: I assume the small-quantity price is the "natural price" and that bigger packages give a bulk discount. All I have to do is consume enough of the bigger package before it expires that I get a non-zero bulk discount. I do similar math with pizza, but since leftover pizza is always good, it always seem to work out that I should order a larger pizza. You made me hungry. Waiting for a takeout pizza. What do you do for non-perishables? Do you always just buy the larger package? For non-perishables other variables come into play, like my effective cost of storage. I'll buy the 18-pack of paper towel rolls because I know I specifically have a place to put them. If I didn't have a place, I probably wouldn't but it. Also, some more good pizza info: in the US most of the big chains use the same sizes. Medium is 12" diameter, large is 14", XL is 16". So the ratio of the total pizza quantity is 36:49:64. Keeping these ratios in mind (or simplifying them to ~3:4:5) when evaluating various menu/coupon options can result in acquiring as much pizza as possible for a fixed amount of money. Hmmm ... I don't eat the crust. Maybe I should go 25:36:49, assuming an inch of crust all around. Regulation is hard. CR's questionable examples show a lack of common sense, but I'm not sure you are coming to the proper conclusion about the new government proposal. And I think your laundry detergent example does the opposite of what you want to show. Let me ask a simple question - what is a load? I went and looking at the 3 different bottles of detergent in my house. All list the number of "loads" in the bottle. But I could not find any definition of what a "load" was...certainly no fluid ounce measurement. And doing the math for what rational folks would assume is a "load" gave me a different amount for each bottle. Perhaps a load is defined by how much you fill the detergent bottle cap (to a line, to the top, etc.)? Or maybe your washing machine has a soap reservoir and a load is filling that? As a statistician, I think you would be unhappy with the uncertainty of what a "load" is. But it seems to me that you take it for granted that "load" describes something in the real world meaningfully and consistently. I actually have tried to measure how many "loads" I get from various detergent bottles (back when I was young, in debt, and reading too many "how to stretch your dollars" forums). I just kept track of how many times I used a bottle until it was empty. It was a little disturbing to find that my 26 bottle only gave 22, and my 80+ was really 63. (I guess the one good thing that came from this exercise was to reduce the amount of detergent I use for the wash...many, many sites on the web that go into how much detergent you should actually use). I then went and did the math - total fluid ounces divided by "loads" - and then tried to see if there was a connection between the load number and the bottle cap (a line on it, filling it to the top, etc). I did not find one for the bottles I tested. So I'm still not sure what a "load" is. If you are not going to define what a "load" is (which I think is near impossible given the number of variables involved...not just amount of detergent, but also machine size, load type, water type, etc. ), unit price per volume is the only thing the government can do. It may not mean that much to you, but at least it is not giving you inaccurate information...which is what would be bad in a government regulation. Price per load would be the equivalent of RBIs...if the batters also got to control hits vs errors. P&G (and others) may not be trying to rip us off, but they certainly want you to use as much detergent as you can...so you go buy more. If they really cared that you understood what a load is, they would write some of that small print text on the label...but I've never seen it. They say the number of loads listed on the bottle is the number of medium loads.